Gennaro Boggia received, with honors, the Dr. Eng. and Ph.D. degrees in electronics engineering, both from the Politecnico di Bari, Bari, Italy, in Jul. 1997 and Mar. 2001, respectively. 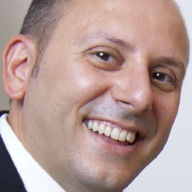 Since Sep. 2002, he has been with the Department of Electrical and Information Engineering, Politecnico di Bari, where he is currently an Associate Professor. From May 1999 to December 1999, he was a Visiting Researcher with the TILab, TelecomItalia Lab, Torino, Italy, where he was involved in the study of the core network for the evolution of 3G cellular systems. In 2007, he was a Visiting Researcher at FTW, Vienna, Austria, where he was involved in activities on passive and active traffic monitoring in 3G networks. During his activity, he got the following awards: Best paper Award at IEEE ICUMT Conf., 2015; AICA 2014 Honorable mention for innovation and originality to the PhD.thesis “Advanced services and performance assessment in Information Centric Networks”; Ph.D. Student: Ilaria CIANCI; Highly accesses paper in 2013 in the EURASIP Journal on Wireless Commun. and Networking; Best Paper Award “Francesco Carassa” at the GTTI 2012 annual meeting; Elevation to the grade of IEEE Senior Member in 2009; Best paper Award at IEEE VTC Fall Conf., 2004. He has authored or coauthored more than 150 papers in int. journals or conference proceedings, gaining more than 2300 citations. He is active in the IETF ICNRG WG and in the IEEE WG 6TiSCH. He is also regularly involved as a Member of the Technical Program Committee of many prestigious international conferences. Dr. Boggia is currently an Associate Editor for the IEEE Commun. Mag., the ETT Wiley Journal, and the Springer Wireless Networks journal. "You cannot explain everything to everyone"